Mary Meeker is probably the closest thing to a rockstar an industry analyst can be. Every year insights from her exhaustive state-of-the-web Internet Trends report captivate decision makers around the world. (Don’t believe us? Scan the laptop screens this week in your nearest airport executive lounge.) True to form, this year’s report is full of juicy insights for social media marketers. This fact has been widely circulated over the last couple of months, but it’s worth repeating: video is huge on Facebook. 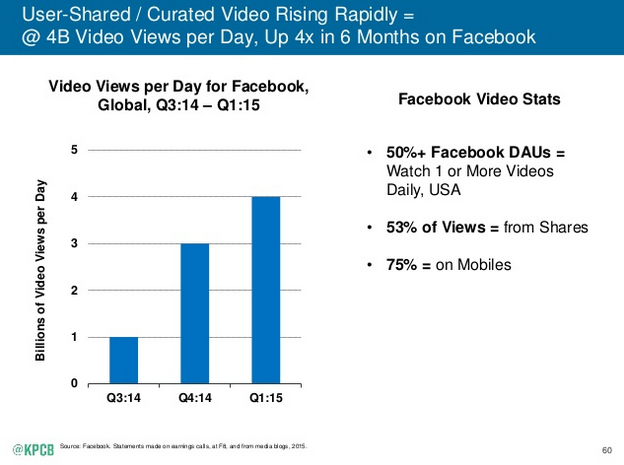 In six months Facebook went from 1 billion video views per day to four. That’s thanks to the more than half of Facebook’s daily active users who watch at least one video every day. An impressive 75 percent of their video views also come from mobile. Brands don’t just need to start thinking about video, they need to start thinking about Facebook video specifically. That means optimizing videos for the Facebook mobile app, testing length, style and subject matter for their Facebook audience, and working on creating shareable content. As social media marketers, this should be on your plate… like now. Pinterest is on a clear path upwards when it comes to content growth, hitting over 50 billion pinned images. That remarkable number represents 75 percent growth year over year for the visual social network. And yet, many people still express doubts about Pinterest’s wide appeal, especially for men. This data goes to show that those claims may be unfounded. Pinterest’s recent growth is especially strong in “non-core” categories—things outside of the food, clothing and decorating niche. The graph uses cars and motorcycles as an example. 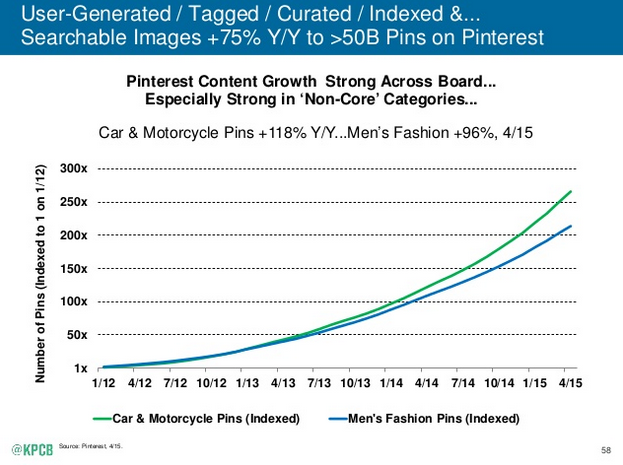 The number of pins including cars and motorcycles grew 118 percent year-over-year, compared to only 96% growth in men’s fashion. For marketers still doubting Pinterest, this should act as a clear indicator that the social network’s audience is expanding. An expanding audience means expanding interests and an opportunity to capitalize on this growing tool. Instagram and Snapchat are the so-called millennial darlings of social media. Their usage among teens and young adults has been widely discussed and analyzed for the last two years. And, by the looks of things, that discussion shouldn’t stop anytime soon. People aged 12-24 increased their use of Instagram by six per cent so far in 2015, with 59 percent of this demographic saying they use the app. 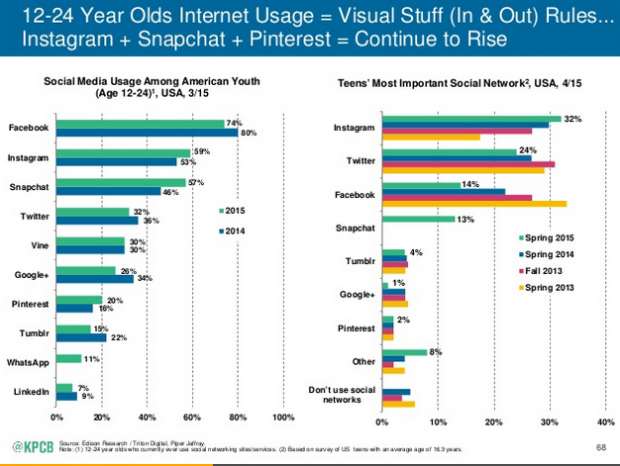 Snapchat saw an even larger jump of 11 percent, bringing it to 57 percent usage among this age group. Compare that to a 6 percent decrease in Facebook usage (74 percent overall) and a four percent decrease in Twitter usage (32 percent overall), and you see where things are trending. That being said, don’t put all your eggs in the Instagram and Snapchat baskets. Twenty-four percent of American teens still consider Twitter their “most important social network,” second only to Instagram (32 percent). That beats out Snapchat, which is most important to 13 percent of teens, by a substantial margin. In other words, if your target audience falls within this age group, start allocating more resources to Snapchat and Instagram, but not at the expense of the larger, more traditional social networks. Marketers have been told for several years now that they should shift focus away from desktop and towards mobile. This slide, which uses data from eMarketer, seems to tell a different story. The graph shows that time spent on desktops within the United-States is stable, at around 2.4 hours per day. What has changed is how much total time people are spending online. As internet usage has grown to 5.6 hours per day (up from 2.7 in 2008), the difference has been made up almost entirely by mobile. Mobile now accounts for 51 percent of internet usage, compared to 42 percent for desktop. 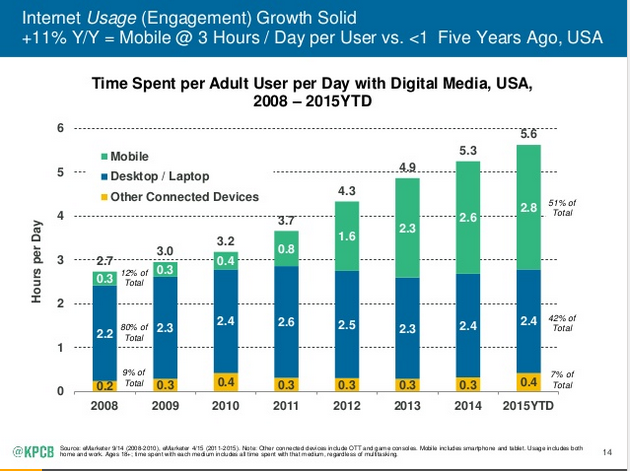 In other words, mobile is extremely important, but people are also consistent in their desktop usage. You shouldn’t ignore your desktop experience for mobile, you should prioritize both. Over the past decade, businesses have clued in to the power of online advertising. According to IAB data, the internet now accounts for 24 percent of the time Americans spend consuming media, and it represents 23 percent of ad spend from American businesses. While those numbers are very close, there’s a huge gap when it comes to mobile. In 2014, mobile also earned 24 percent of media consumption time among Americans. 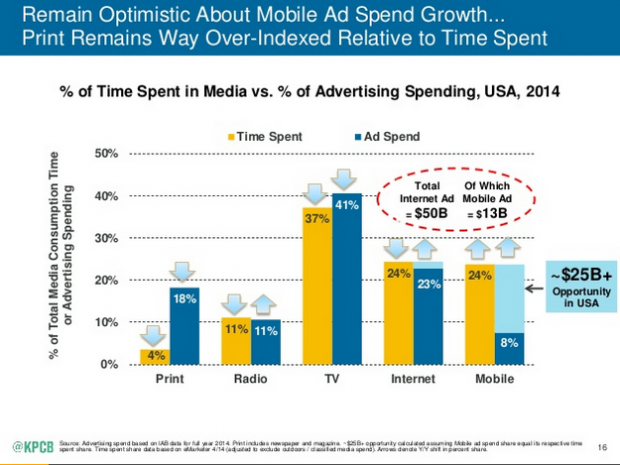 In terms of ad spend, though, mobile sits at only eight percent. That 16 percent difference represents $25 billion in opportunity for businesses willing to shift more budget towards mobile ads. Where can they find that money? How about in their print budgets, which represent 16 percent of ad spend while accounting for only 4 percent of media consumption. Although mobile ads still aren’t getting enough ad spend from marketers, social networks and tech companies understand the potential and are working on creating mobile-optimized ad formats. 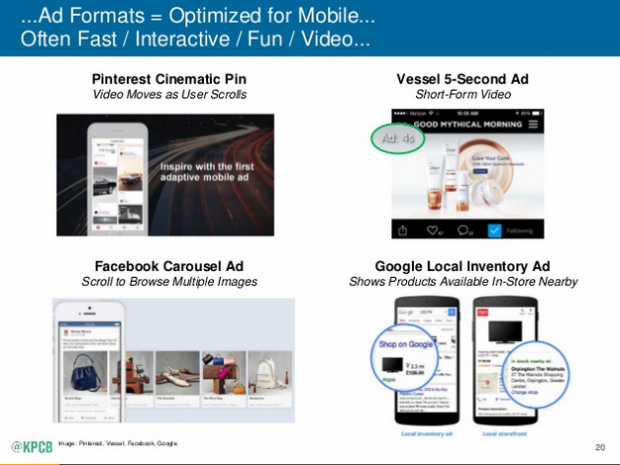 Catering to the mobile audience, these tools promote ads that are fast (Google Local Inventory Ads), interactive (Pinterest Cinematic Pins), often fun (Facebook Carousel Ads), and frequently video-focused (Vessel 5-Second Ad). Now it falls on you, social media marketers, to determine how to use these optimized ad formats. 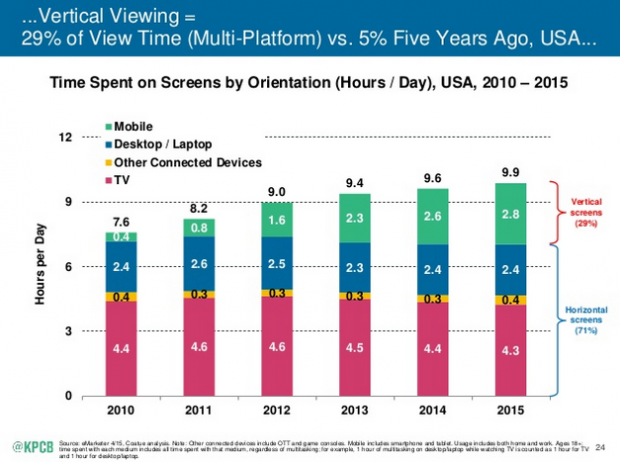 Forget everything you knew about optimizing video: vertical viewing is growing dramatically. Where only five years ago it only accounted for five percent of time spent on screens, vertical viewing has grown substantially, to 29 percent. This is bolstered by the rise of apps like Snapchat, Periscope and Meerkat, which force individuals and businesses to view and share videos shot horizontally. This represents a new challenge for marketers who have, for so long, emphasized the importance of horizontal video. Don’t let anyone tell you that games hold the crown when it comes to mobile. That title goes to messaging apps, which hold six of the top 10 global positions when it comes to usage. 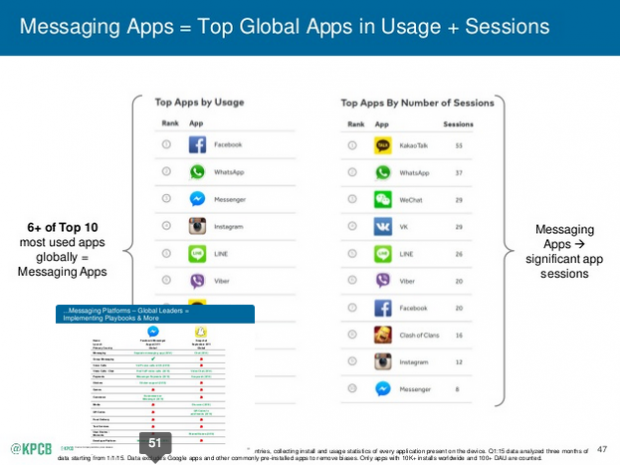 Messaging apps also lead the way when it comes to the number of sessions. So how can businesses capitalize? Messaging isn’t an easy egg to crack for social media marketers. However, Facebook has already made moves to integrate apps and businesses into Facebook Messenger. Brands should be prepared to take advantage, as other messaging apps may follow suit. Do you have an online store? Do you sell your products or services on your website? What about on online retailers like Ebay or Amazon? If not, here’s the one slide that will make your boss reconsider. E-commerce now represents nine percent of American retail sales. You may be thinking that nine percent isn’t all that much, but that single digit represents over $300 billion in the U.S. alone. Not only that, but that figure was just about zero less than two decades ago. 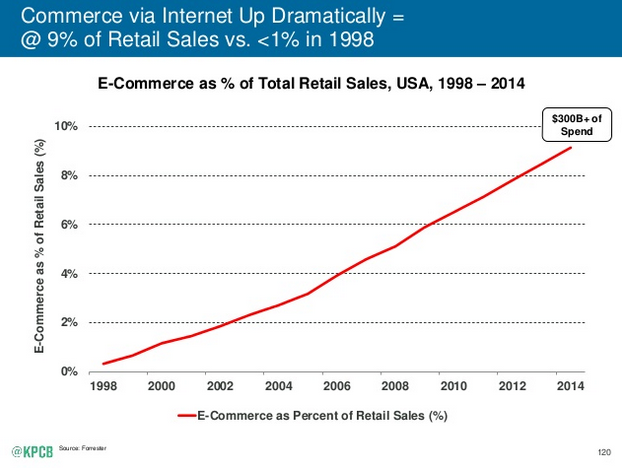 E-commerce has never been more important. Are you putting enough effort into your online sales? All images are from Mary Meeker’s Internet Trends 2015 – Code Conference report. You can access that report in full here or see it embedded below.